18 Moorish-style villas located on the beach. 1-5 bedroom villas and suites available. 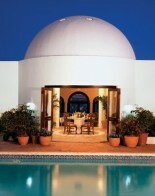 Cap Juluca is located on the island of Anguilla which is situated 6 miles (15 minutes by boat) from St Maarten. American Eagle connects Anguilla directly with San Juan, from which direct flights service almost every major city in the U.S. Just seven miles away, St. Maarten's Julianna International Airport is serviced by direct flights from New York, Chicago, Miami, Raleigh/Durham, Paris, and Frankfurt. Ferry boats frequently make the 15-minute run between Anguilla and St. Maarten's French port of Marigot. Scheduled or charter flights are available for those who prefer the eight-minute flight from St. Maarten to Anguilla. Charter boat service, including airport pick-up, is another alternative for those who reserve in advance. A scheduled ferry leaves Juliana Airport in St. Maarten during lunchtime (1:00-3:00). 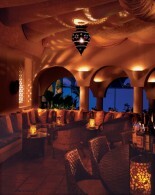 Cap Juluca is a luxury resort located on the island of Anguilla in the Caribbean. It is a private self-contained enclave along two miles of beautiful white, pristine beaches. This luxury resort offers spacious and luxurious Moorish villas – with this beautiful accommodation, tropical gardens, five star restaurants and world class personal service, it really is one of the most luxurious resorts in the Caribbean. The eighteen villas are all separate and are located right on Cap Juluca’s private beach. Each villa has 1-5 bedrooms and inside are decorated with beautiful high quality furnishings. All the villas have cool white tile floors, louvered doors and windows to maximize continuous sea breezes. Breakfast is included in the nightly rate, and this is served on your own private terrace. Each room comes with a private ocean view terrace, ceiling fans, air conditioning, telephone, refrigerator, marble bathroom, separate shower, and bidet. With the magnificent backdrop of Maundays Bay, Cap Juluca's two award-winning beachfront restaurants, Pimms and George's, offer two of the best dining experiences in the Caribbean. These enchanting open-air restaurants feature sumptuous and inventive fare by award-winning chefs along with impeccable service. Prices quoted include a Full English Breakfast, one group Tai Chi class for two, 8 hour butler service, water sports, tennis and afternoon tea. 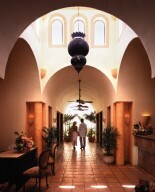 At Cap Juluca there are a variety of activities to take part in. Many activities are complimentary, and included in the price of your room, however some do cost extra. Please see side menu on Activities for more details.